“Pain in the Glass” winners pose with President Bridges and Rob Freelen ’00 of Silicon Valley Bank who offered an extra $1000 to Whitman’s winners. 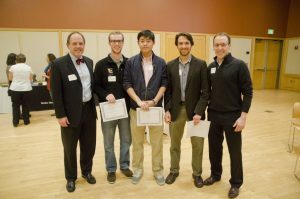 It started in the Fall of 2013 with a business plan competition called “Pain in the Glass.” A team of three then-Whitman students competed for top honors and $300 with their plan to convert glass refuse in Walla Walla into a seaglass-looking substance for use in landscaping and home decor. Fernando Medina Corey ’14, John Lee ’16 and Cody Burchfield ’16 won the top award that night and have since all moved their entrepreneurial aspirations and careers beyond Walla Walla Seaglass. The event has moved on as well, and tomorrow night, first-year Whitman students Alex Woodard & Steven Cockey will be competing in the final round of the evolved competition: Pitch It! – a Shark Tank-style pitch & business plan competition with $10,000 of investment money on the line to help them get their business running. When I asked Alex & Steven what prompted their interest in this competition, their story was one of circumstance. Since they spent winter break creating a website and discussing plans for a new business venture, when they returned to campus and heard about Pitch It!, the timing seemed fortuitous. They attended the first workshop and were introduced to tech sector veteran Jason Copeland ’94 who has provided excellent mentoring for their venture. Come watch Alex & Steven present their pitch Tuesday, March 6 at the GESA Power House Theater – 5:30PM start time. Need transportation? Meet at Reid Center lobby at 5:00PM to catch a ride with the SEC!